We are all involved in relationships. Indeed, we are all in relationship with everything and everyone, all of the time. We have a relationship with ourselves, with our family, with our environment, with our work, with each other. Everything that we know and experience about ourselves, we understand within the context created by our relationships. For this reason, relationships are sacred--all relationships. And somewhere within the deepest reaches of our heart and soul, we know it. That is why we yearn so for relationships--and for relationships of meaning. It is also, no doubt, why we have such trouble with them. At some level, we must be very clear how much is at stake. Yet it is possible to have joyful relationships, and the extraordinary insights in the Conversations with God books show us how. Neale Donald Walsch on Relationships is inspirational, humorous, and practical. 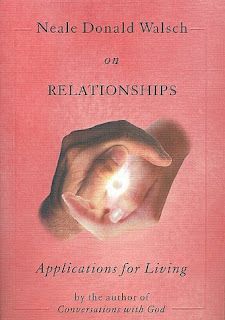 Neale examines the patterns that hinder our ability to build and maintain successful relationships; teaches us to move beyond restrictive ways of relating; and explores different types of relationships--with God, with self, with others--demonstrating how they all affect and enhance each other. If you want help in understanding relationships, here is a usable, powerful--and entertaining--key to opening the door to awareness.